TL;DR: we surveyed customers who carry the now-retired Tortuga Air on their travels. We learned a few key things about how they travel, which features of the product they particularly love, and where we could improve. We’re incorporating those learnings into a brand new backpack launching this summer. In 2016, we retired our entire line of products (known as V2 to long-time fans) and replaced them with new versions. We built the V3 line of travel backpacks based on our many years of traveling, research, and product development. In that batch of retired products was a backpack called the Tortuga Air. It wasn’t our best selling product, but it was, arguably, our most beloved. I won’t go into huge detail here, as we haven’t sold or produced this backpack in years, but I think it’s helpful to know a bit of context given the topic of this post. Travelers who were advanced in the art of packing light would bring the bag on longer adventures, but the vast majority of people used the Air for trips of a week or less. We aren’t redesigning the Air, but we are working on a new bag with the same benefits for the same type of travelers. Our first step was to revisit what our customers loved about the Air and what they thought we could improve. Here’s what we learned. The Air’s smaller, compact size was a particular draw for light packers and travelers taking shorter trips. Many customers cited that they’d slide the Air under the seat of an airplane instead of needing to place it in an overhead compartment. That convenience was an important one, as it meant customers would carry the Air in tandem with a rolling suitcase on a longer trip and didn’t have to worry about overhead space if it was their only bag. Takeaway: for light packers, a smaller size is crucial. Ideally, a similar product should fit under the seat on most airplanes. The Air was more rounded than the Outbreaker collection. It felt like a backpack first and a suitcase second — which is a difference from our maximum-sized carry on backpacks. Carrying a 45L bag that seeks to maximize packing space (like the Outbreaker) does, indeed, can feel like having a suitcase on your back. For some travelers, that’s an ideal scenario. But not so for the Air audience. 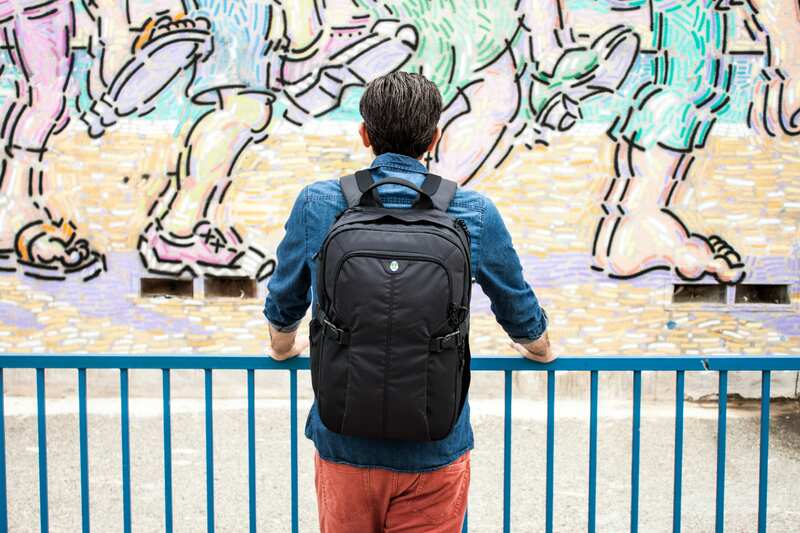 Takeaway: a rounded shape and a backpack that wears like a backpack are both important. 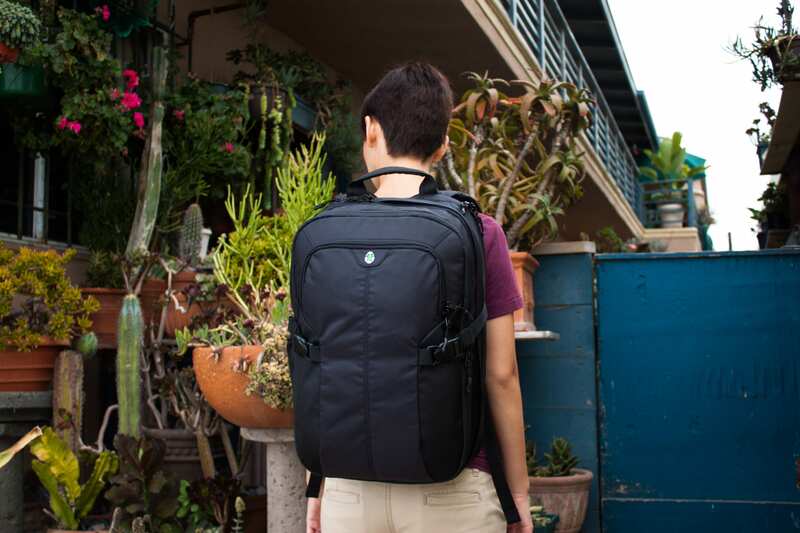 All Tortuga backpacks are front-loading for easy packing, which means you pack them from the front and not the top. Top-loading backpacks are frustrating to pack, even more fustrating to unpack, and leave your stuff a jumbled mess. 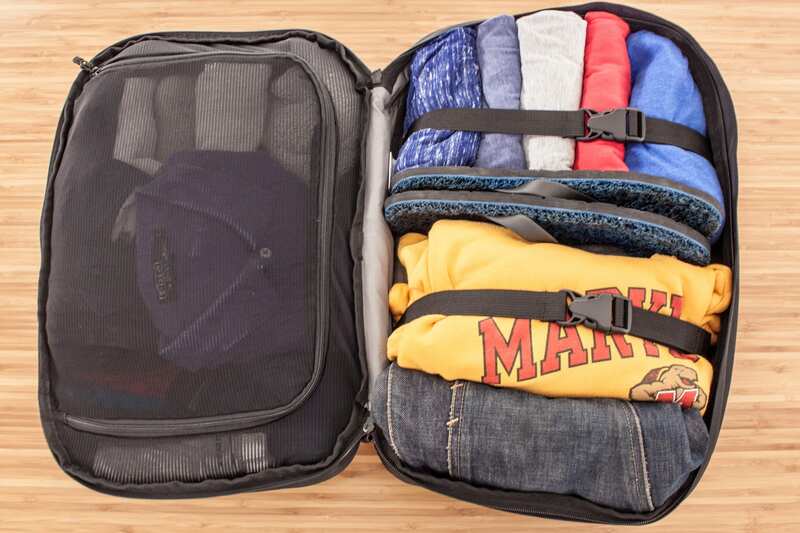 There’s a zipper in the middle and two divided compartments for your clothes, like the Air as shown below. A middle opening with two divided compartments was the #1 most beloved feature of the Tortuga Air. Takeaway: this bag should open from the middle, like a book, and have two divided sections in which to organize your clothes. Note: the inclusion of a hip belt on a small (25L) backpack is polarizing. Some travelers love hip belts and want one no matter how small the bag or how light they packed. Others never use a hip belt and find them cumbersome, even on a heavy pack. Our solution to these opposite desires is to make our hip belts removable on all Tortuga travel backpacks. We plan to address all of the above requests, and all of the Air’s beloved benefits, in a product launch this summer. To reiterate: we are not redesigning the Air. We are, however, building a new backpack that seeks to address the same benefits for the same types of travelers. Stay tuned as we’ll share an announcement and sneak peek at the new product in the coming weeks. Sign up for the Packsmith newsletter to stay updated on new products. You’ll also get weekly travel hacks, gear reviews, and packing tips sent straight to your inbox. As a thank you, we’ll send you a carry on packing list right away.